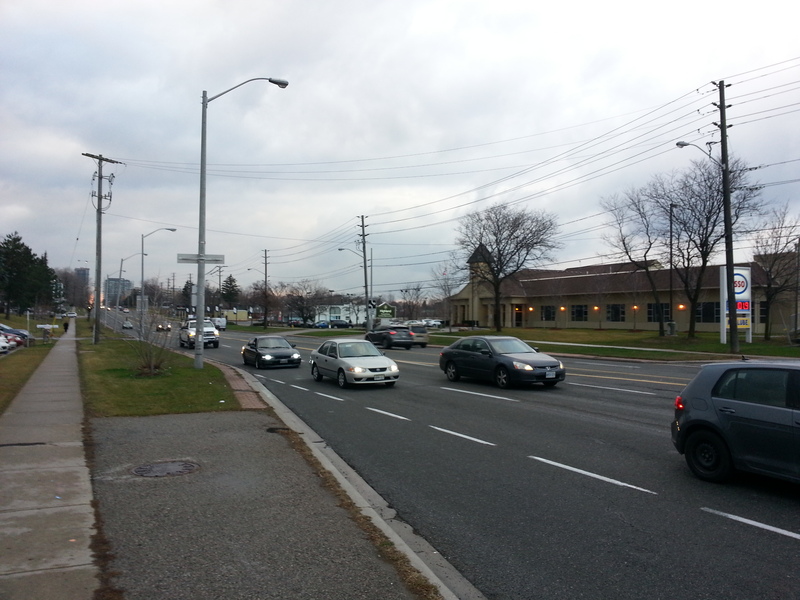 Kennedy Road between Finch and Linwood Avenues is, at first glance, an inconsequential stretch of street. 1km of nothing. A bit of digging, however, and there’s a story. There’s always a story. Beginning at the top, there’s the Hugh Clark House. A rural leftover nestled in behind a gas station. 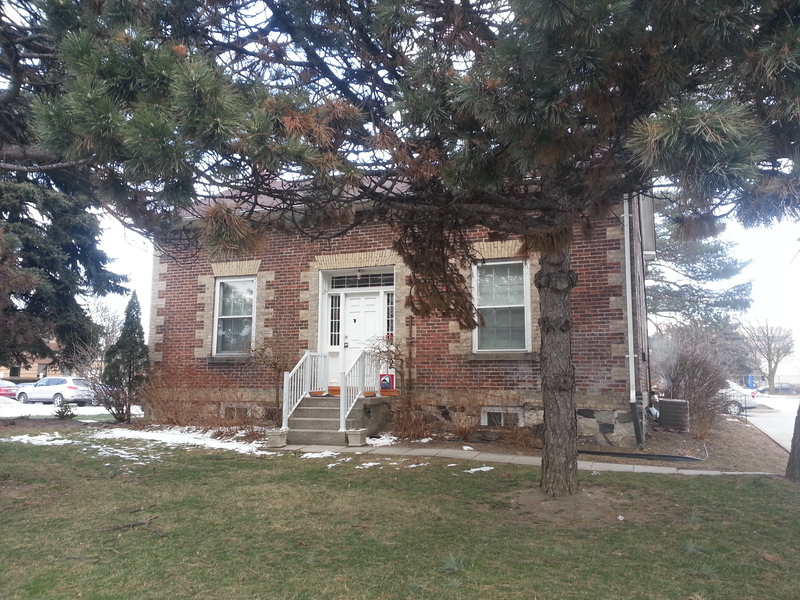 The Clark family once lined the north side of Finch with their farms. The first of the Clarks to plant his roots was Hugh‘s father, William, who settled two lots over at Birchmount Road in 1838. I wrote a little bit about the elder Clark while exploring his property at today’s L’Amoreaux Park. Crossing the street, one comes to an innocent looking parkette. 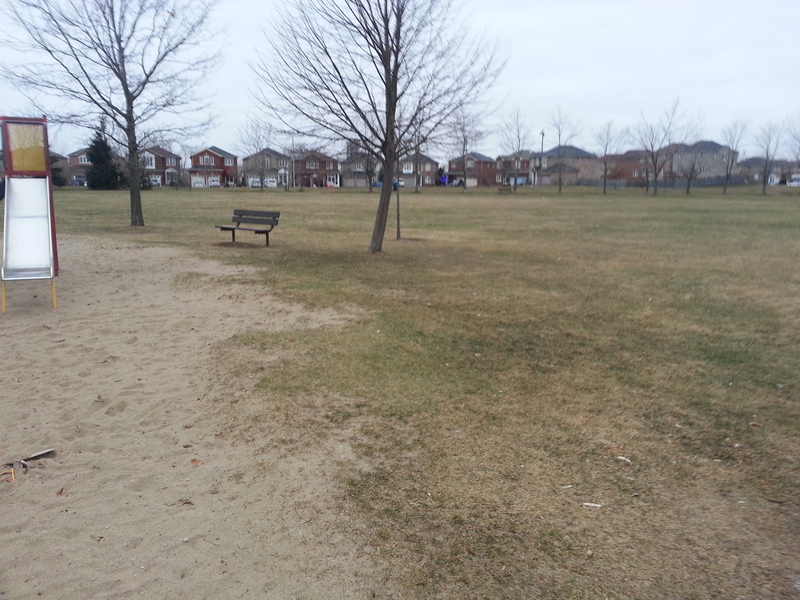 Today’s park, however, is yesterday’s street jog. Kennedy at one time jogged left at Finch, forcing a northbound traveler to turn left and then right before continuing north. At some point Kennedy was reconfigured to run seamlessly through the intersection. An orphaned section of the old route remained south of Finch, however. The old Kennedy bus used to turn around at the loop when the bus route terminated at Finch. 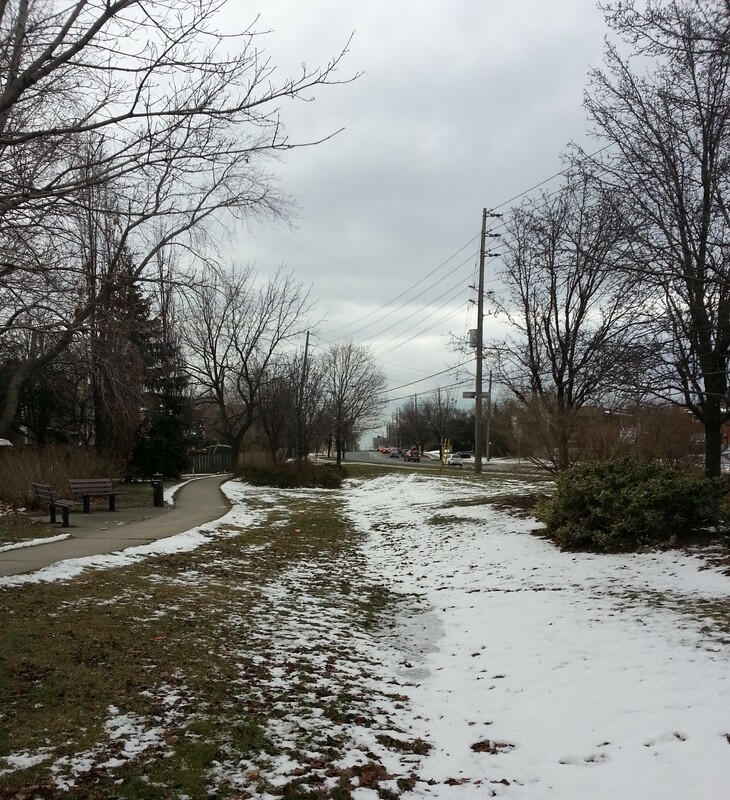 The triangular jog was eliminated for good in 1979, leaving us Kennedy Road Parkette. Next, Lynnwood Heights on Southlawn Drive has been around since 1956. The school’s TDSB webpage notes an original population of 400, a staggering far cry from the current enrollment of 160 pupils. 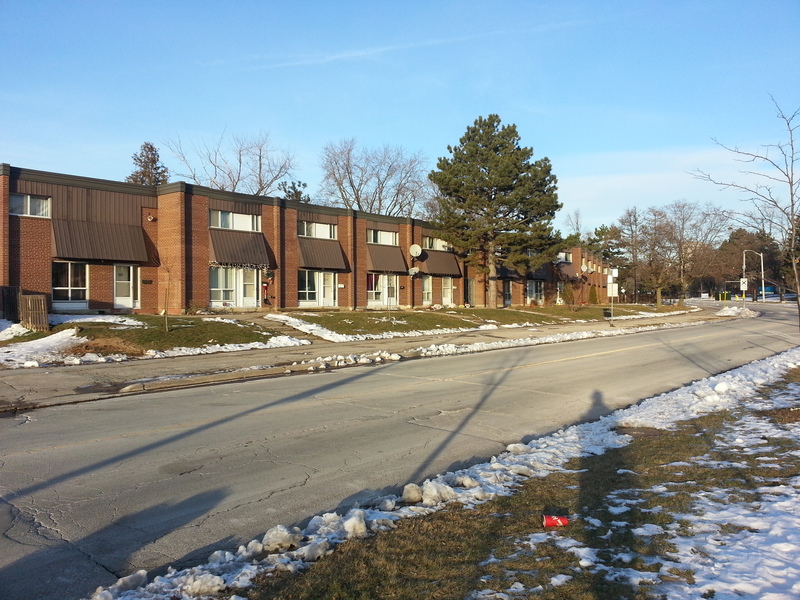 The surrounding subdivision also dates from around 1956, making it one of the older post-war developments in northern Scarborough. One can imagine as the area continued to grow, more schools opened to relieve Lynnwood. 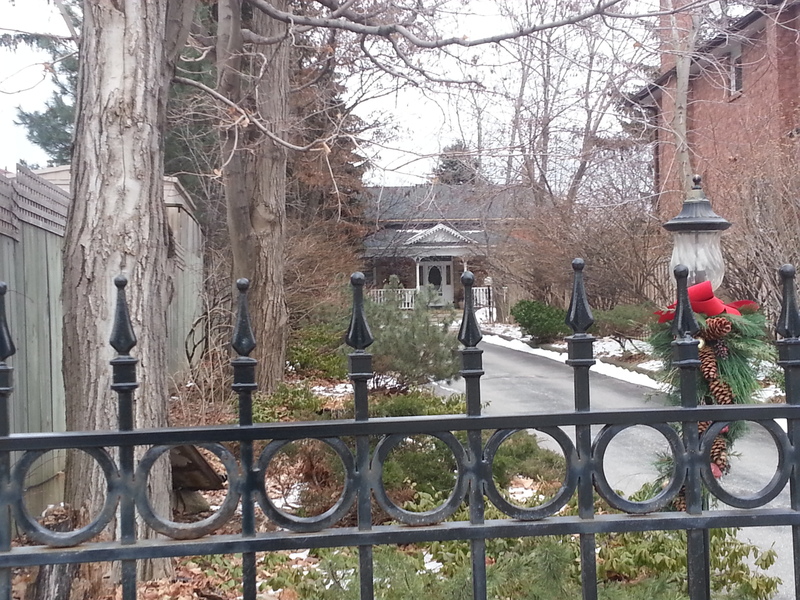 Huntingwood Drive is an east-west alternative to Sheppard and Finch (at least, between Victoria Park and McCowan), but its existence is a relatively recent thing – around 1967, more specifically. It’s odd in the way it snakes close to Sheppard in some parts and close in Finch in others. Kennedy Road & Area, 1965. Source: City of Toronto Archives. The future Huntingwood Drive is pencilled in bottom left. Finch jog at top. 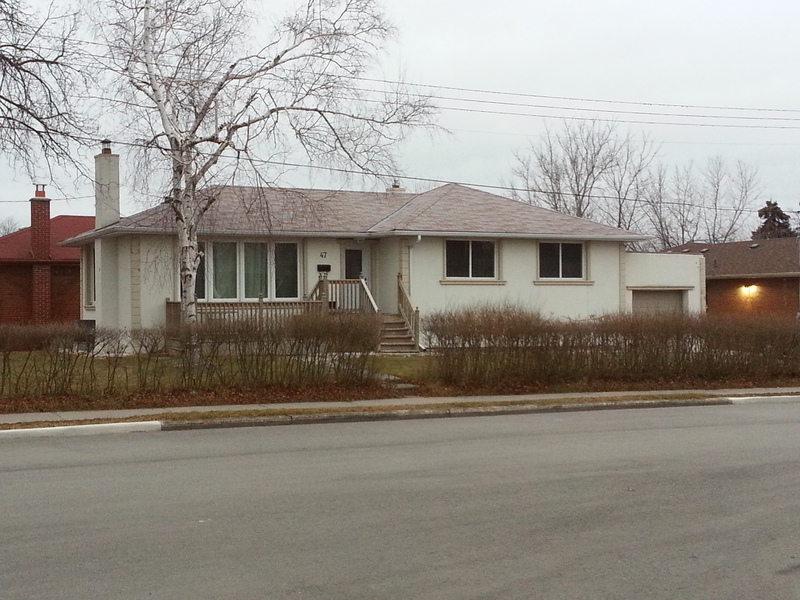 Bookending the kilometre stretch is another farmhouse, Elmridge. This was the Pat(t)erson family homestead. Or, at least, one of them. Like the Clarks, the Patersons were a pioneering Scarboro family who toiled the land on the east side of the street between Sheppard and Finch. Robert Bonis writes in A History of Scarborough that a Thomas Paterson arrived here in 1820 from Scotland, clearing the land with his son. His descendants continued his work at Elmridge, eventually making the Paterson name synonymous with Agincourt. This excellently researched WikiTree entry breaks down the life of Thomas Archibald Paterson, the great-grandson of the original Thomas Paterson. Consider this a sequel. Or, maybe a prequel. Whatever the case, if Wishing Well Acres is the Sullivan in Tam O’Shanter-Sullivan, here’s the Tam O’Shanter part. We begin at Agincourt Mall. The shopping centre dates back to 1966, likely making it the third enclosed mall in Scarborough after 1954’s Eglinton Square and Golden Mile (Cedarbrae Mall predates Agincourt by four years but didn’t get its ceiling until 1972). The mall’s anchors are Wal-Mart and No Frills, but I can recall a time – in 1994, specifically – when they were Woolco and Loblaws, respectively. Walmart bought Woolco that year. No Frills came in the 2000s. As much as malls like Agincourt are seen as shabby and sad (Agincourt Mall as of 2016 has a number of empty tenants), I’ve found that they are still appreciated locales. A lot of nostalgia fills their walls. The comments in this BlogTO article about Agincourt Mall by Robyn Urback prove that. Everyone has a story, or a store they enjoyed frequently, or an odd memory about something that isn’t there anymore. Mine is the RadioShack that was there in 1990s and 00s, reminding me of lost Canadian retailers. 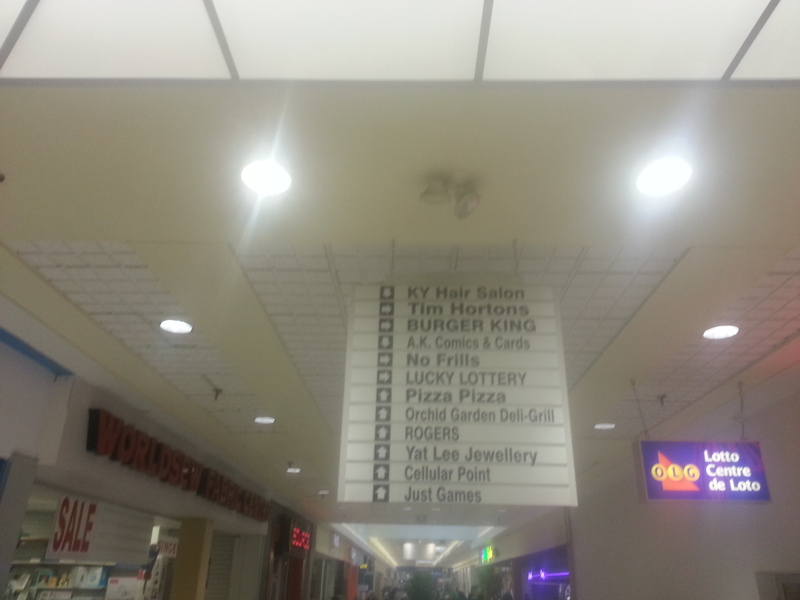 There is a Source in the mall now, but not in the same space as its predecessor. Agincourt Mall was built on the Kennedy farm, with the farmhouse once located just north of the mall and south of the West Highland Creek. 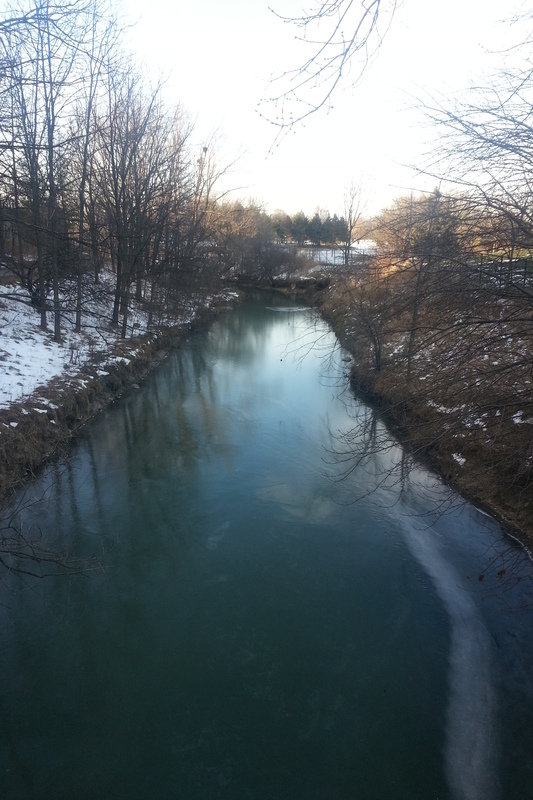 A walk down the street named for the family leads to a trail that lines the creek. The path is sandwiched between an apartment and townhouse complex on one side and the creek and Tam O’Shanter Golf Club on the other. 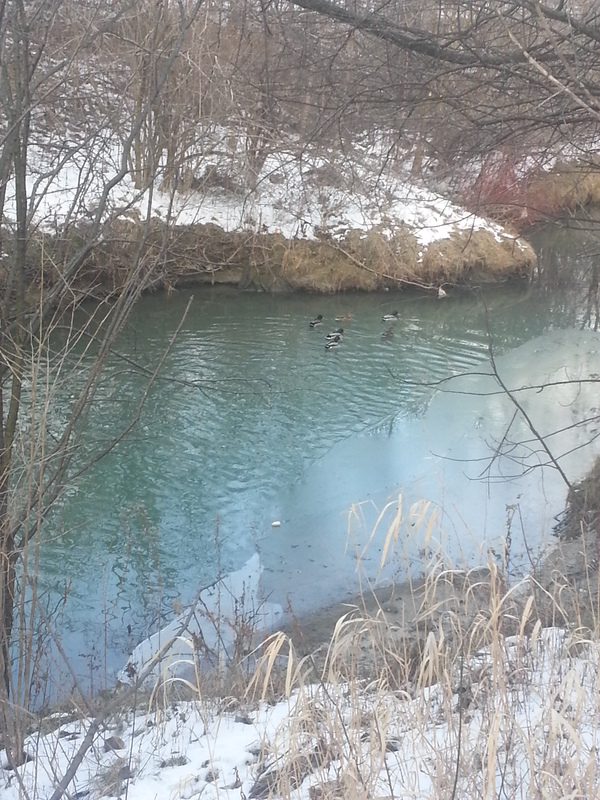 A look down at the shallow waterway produces a shiny sheet of ice over the surface and the occasional group of ducks in the non-frozen bits. But there’s also something that doesn’t quite belong. 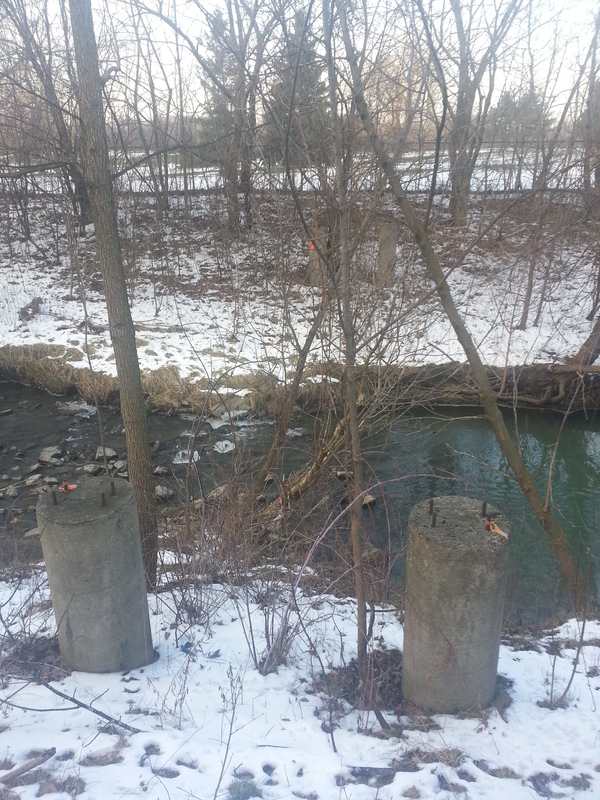 Several pillars jut out on either side of the creek – two on one side and two opposite them. I count three sets of these abutments along the way. Their meaning isn’t hard to figure out: 3 sets of abutments, 3 phantom bridges. There is one question, though: what’s the story? The answer: In the 1930s to the 1970s, this was the site of the Tam O’Shanter Golf and Country Club, the precursor to Tam O’Shanter Golf Course. Tam O’Shanter Country Club, 1960s. Source: Scarborough Archives. In addition to golf, the Tam O’Shanter Country Club complex had swimming, ice hockey, and curling. In 1971, the club erupted in flames, destroying some of the complex. In researching the fire, I’ve read many stories about people seeing the flames from afar. Like Agincourt Mall, the country club meant something to many people. In 1973, the Province of Ontario, Metro Toronto, and Scarborough jointly acquired Tam O’Shanter and converted it into a municipal golf course. In the coming years, the complex would be gradually demolished and a new clubhouse would be built around 1980. Today, a couple of apartment towers on Bonis Avenue stand in the club’s former location. Tam O’Shanter & West Highland Creek, 1967, Source: City of Toronto Archives. 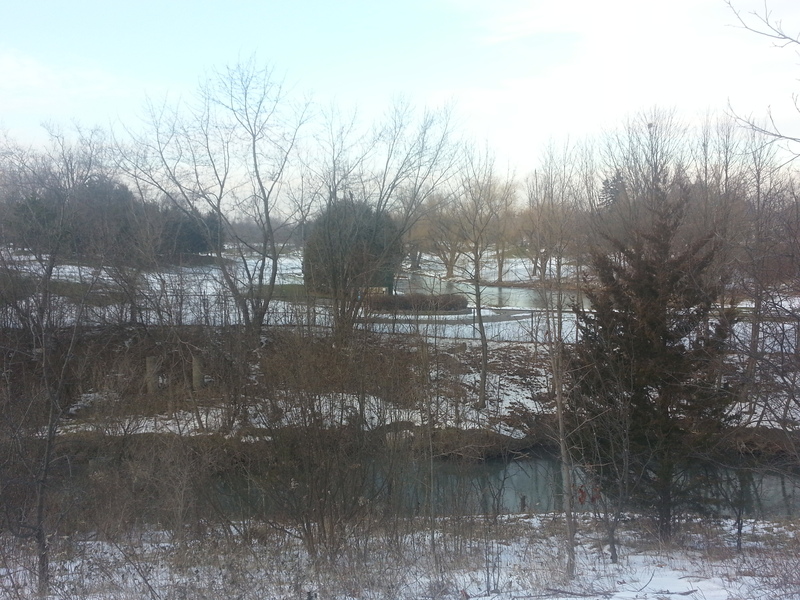 Back to the abandoned abutments, the creek was located just behind the clubhouse and its bridges led to and from the golf course. Shortly after the course’s acquisition, the bridges were removed, presumably because the course layout would be reorganized. But the creek hasn’t always run the same course. Tam O’Shanter & West Highland Creek, 1956, Source: City of Toronto Archives. The West Highland at one time swung north up into the golf course before dropping back down and resuming in a northwest direction. Around 1967, the creek was straightened and bridges were installed. The orphan bend remained as a sort of oxbox for some time, but since has been mostly filled in. One can still see the imprint of the bend today, though, notably through the pond and the ‘etched’ curved outline north of it. Tam O’Shanter & West Highland Creek, 2015. Source: Toronto Historic Maps. There is one remaining bridge, however – a wider, sturdier construction. 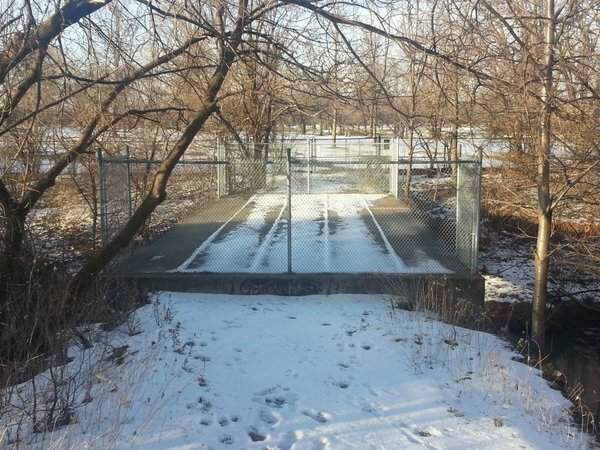 There is a gate in the fence on the other side, so one can guess that at least it might have been a vehicular corridor. As of 2015, though, both ends have been barricaded to prevent any sort of use. 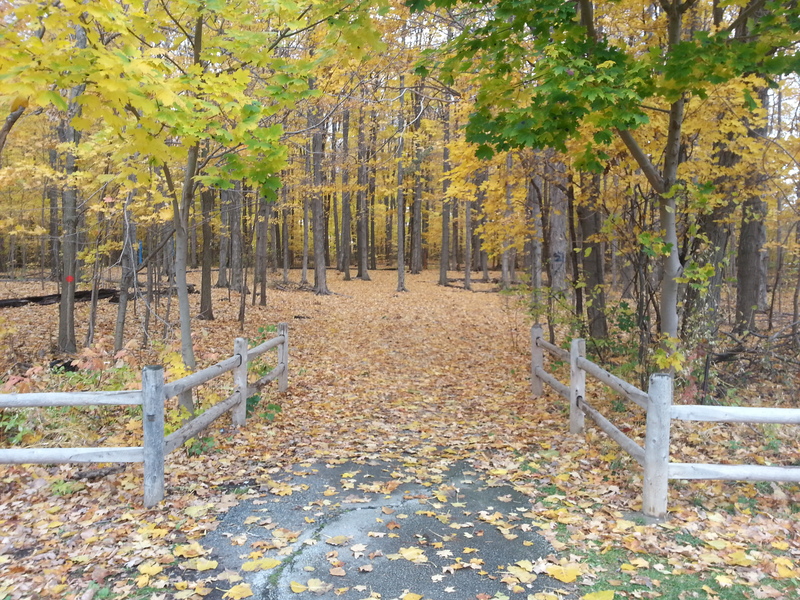 As the West Highland continues into the golf course and beyond, the trail comes to Ron Watson Park, renamed from Tam O’Shanter Park in 2005 in recognition of the long-time Scarborough resident, trustee, and councillor. Watson was honoured with a star on Scarborough’s Walk of Fame in 2011. The park forms the field of Tam O’Shanter School, featuring a nice playground…and a stone turret. 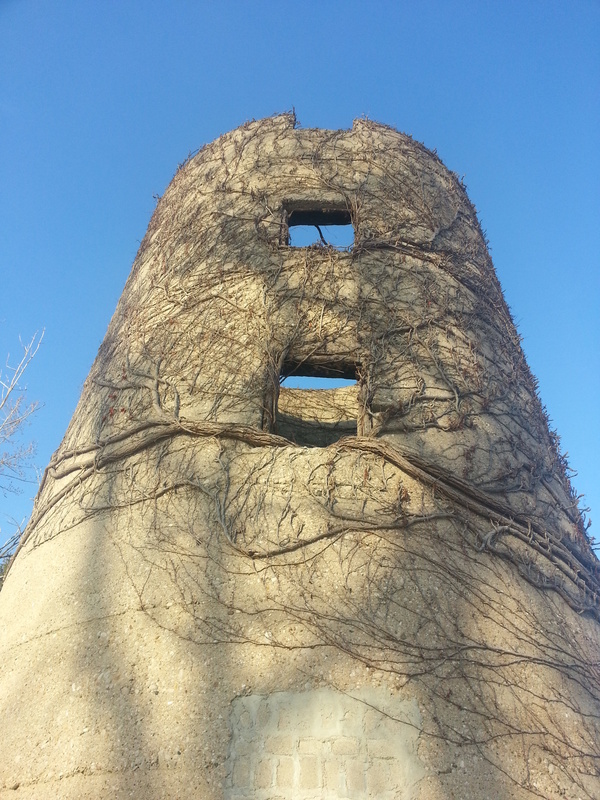 This viney tower became an instant curiosity to me. It looked old and misplaced. No doors (although, perhaps a sealed opening), a couple of ‘windows’ near the top. What was/is it? I had to do some digging. 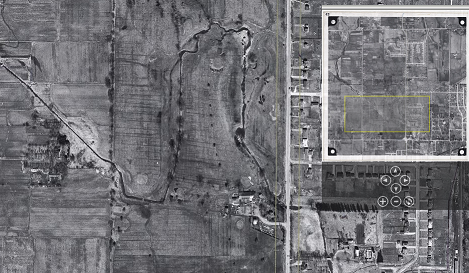 Google presented nothing, so I consulted some aerial photos to try and date it. It’s been around since at least 1947, the first year on record for aerials in the Toronto Archives. Charles Watson Farm, 1965. Source: City of Toronto Archives. Ron Watson Park, 2015. Source: Toronto Historic Maps. 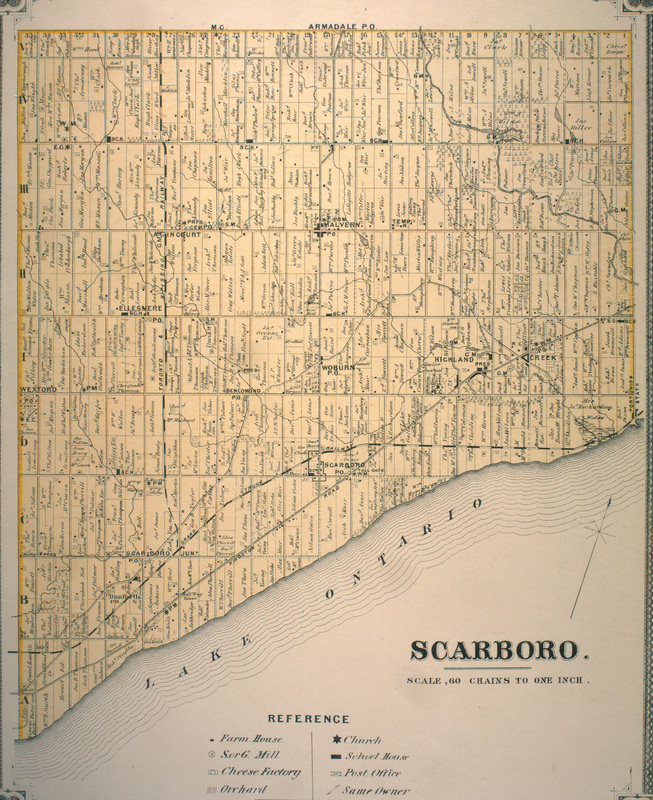 Next, looking at the 1878 Map of Scarboro Township, Ron Watson Park was once part of the Samuel Horsey farm on Concession 3 Lot 30. Whether Horsey built the mystery tower is unknown. His house had a parlour, though! 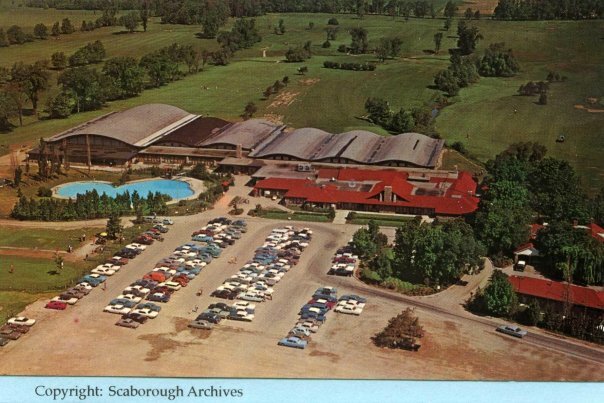 Posting my findings and curiosities on Twitter, answers came in from the Scarborough Archives. So, Horsey sold his farm to Watson, who likely built the silo. 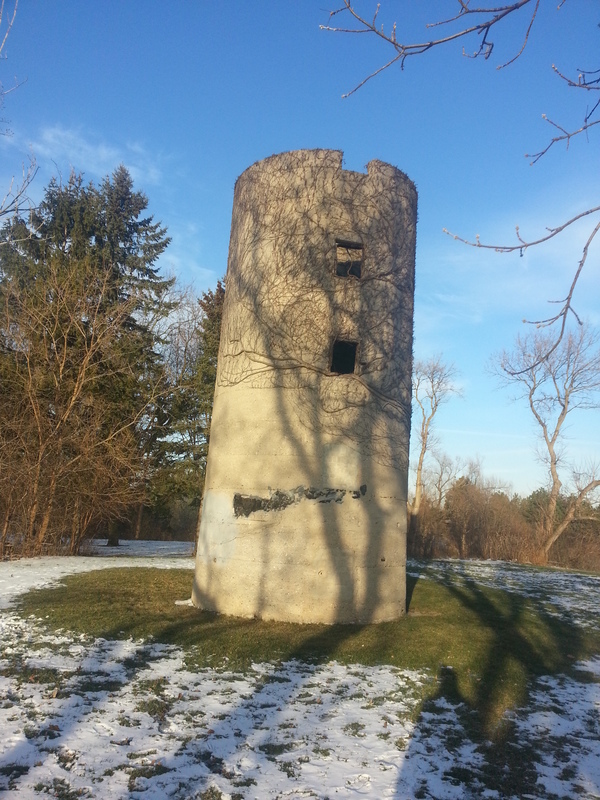 When Watson’s farm was subdivided, the tower was never torn down with it. My guess is the task proved too difficult. It doesn’t fully answer the ‘when?’ part, but mystery solved! 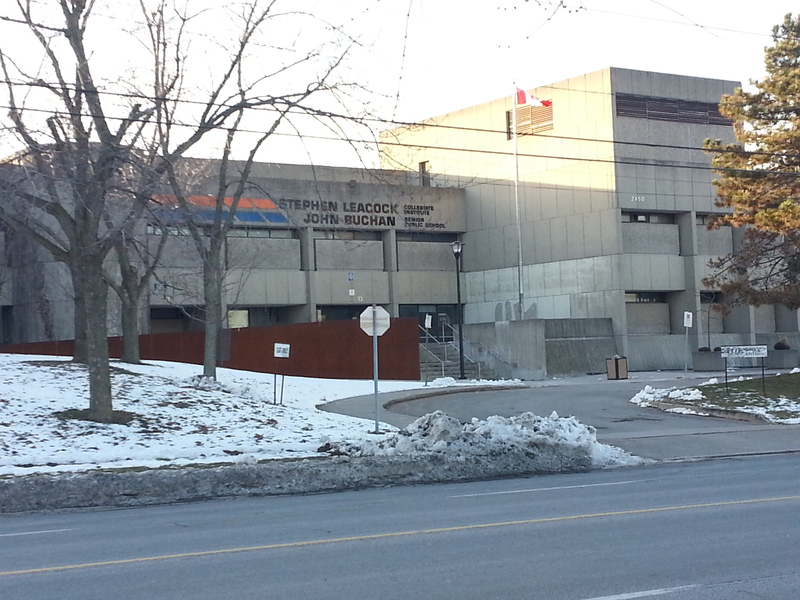 Leaving the park and silo, the two-in-one Stephen Leacock Collegiate/John Buchan Senior Public School has had a place on Birchmount Road since 1970. 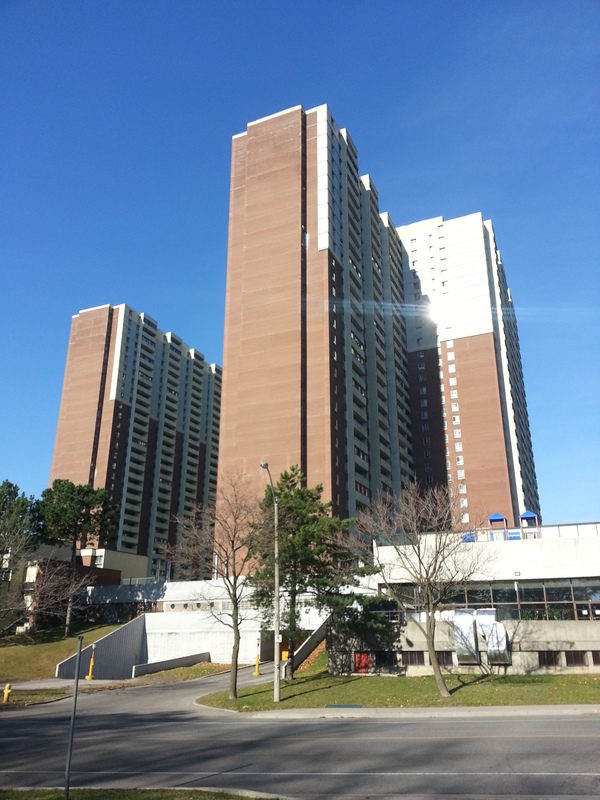 It is built in the Brutalist (or, Heroic) style that was indicative of Toronto architecture in the 1950s to 1970s. The schools’ namesakes were a Canadian author and humourist and Scottish author and historian, respectively. And while I’m profiling, Tam O’Shanter is a Robbie Burns poem. Another Scottish connection. The Anglo-Saxon roots and references of the Tam O’Shanter community is interesting though, considering what it became. 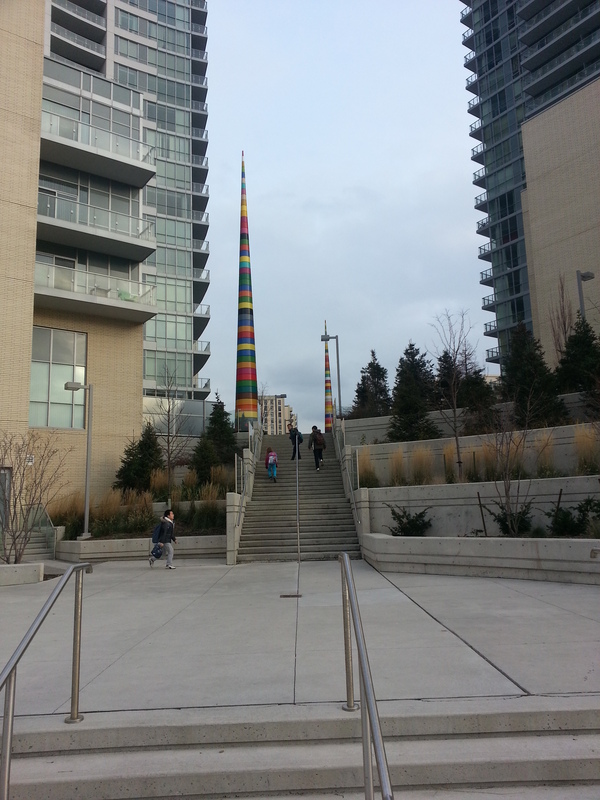 Today, it is one of the more diverse areas in the city of Toronto. 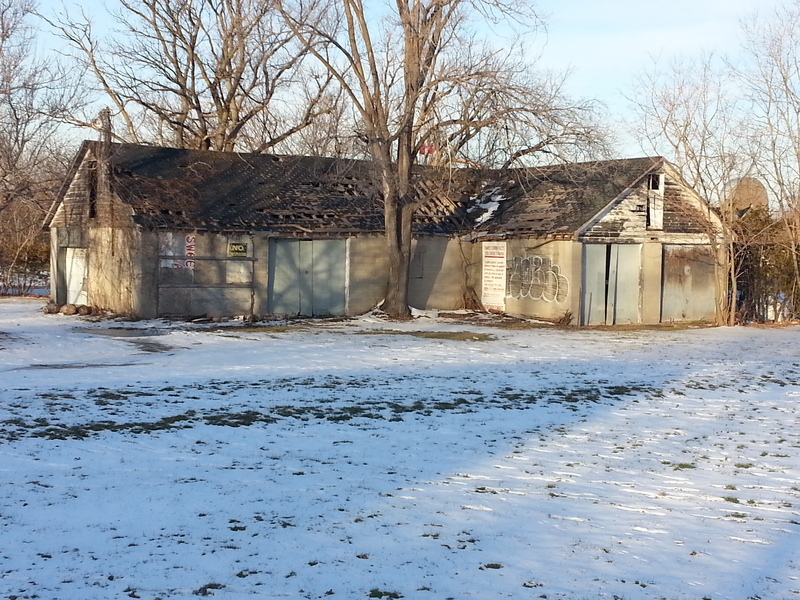 Next, a derelict structure stands across the school. I don’t know its full context, but it’s most definitely another rural leftover. 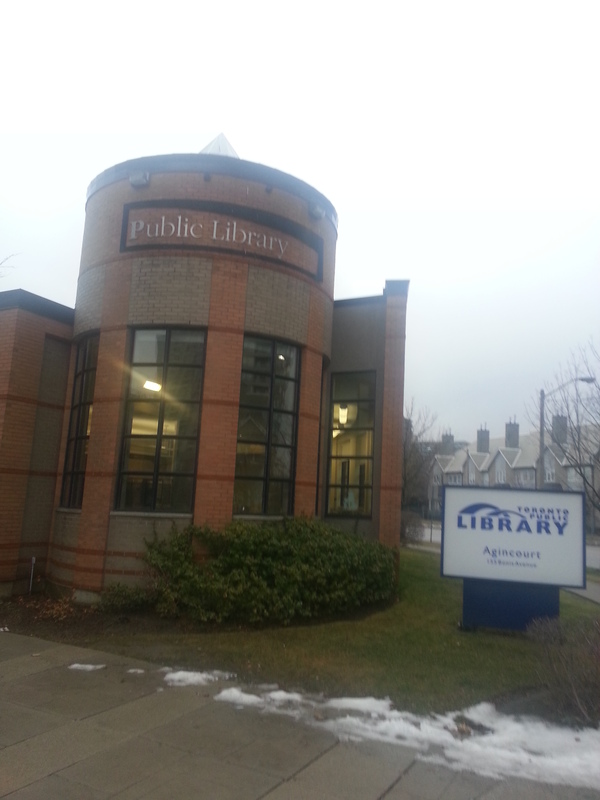 On Bonis Avenue, there’s Agincourt Library and another great turret. Although the building opened in 1991, the library itself dates back to 1918. 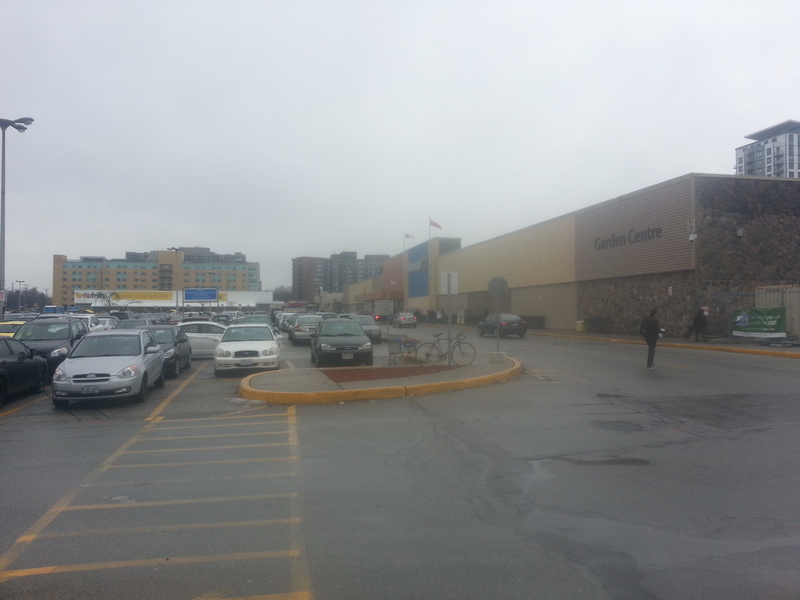 Within that time it has moved locales a few times, including a stay in Agincourt Mall. The branh carries three copies of A History of Scaborough. Its editor is a Mr. Robert Bonis, who lends his name to the street. Down at Birchmount and Sheppard, a strip mall has gone through a makeover in the last few years. 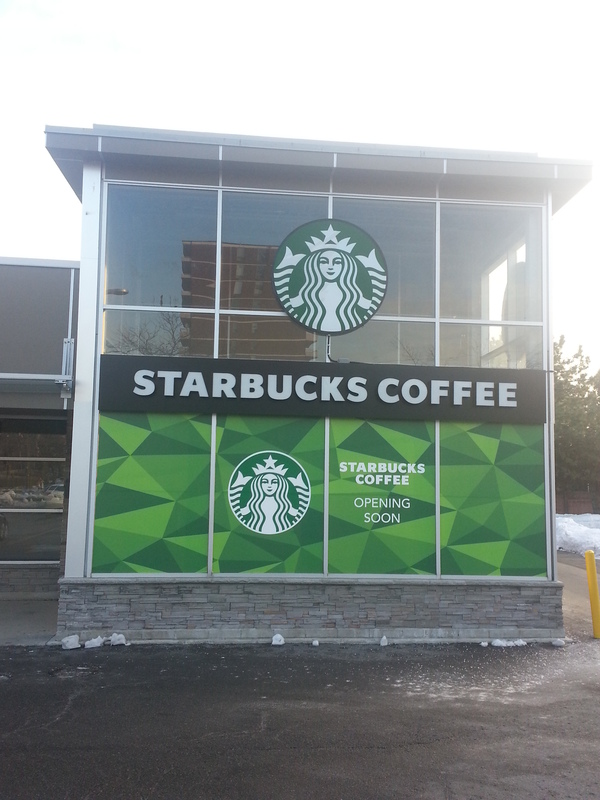 It’s about to get a new tenant, too: Starbucks. The sight is initial shock for me, if only because it’s strange to see one in this neighbourhood. My mind shoots to the old idea that a Starbucks is tell tale sign of gentrification, but I question whether it applies here. We’ll have to see. 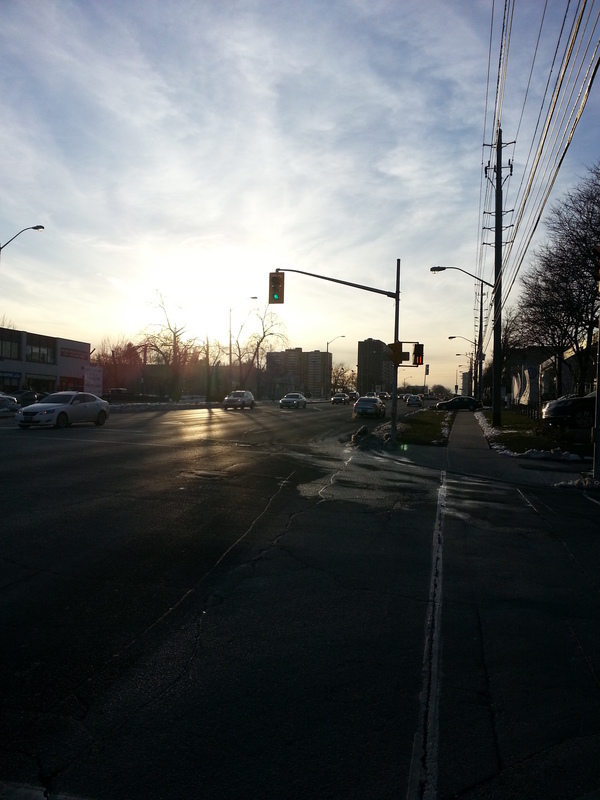 Foregoing a stroll down Sheppard, I backtrack to Bay Mills Boulevard. The curved street offers a sort of ‘backstage’ view of Tam O’Shanter, showing off the apartments, church, school, field, playground that all front Sheppard. 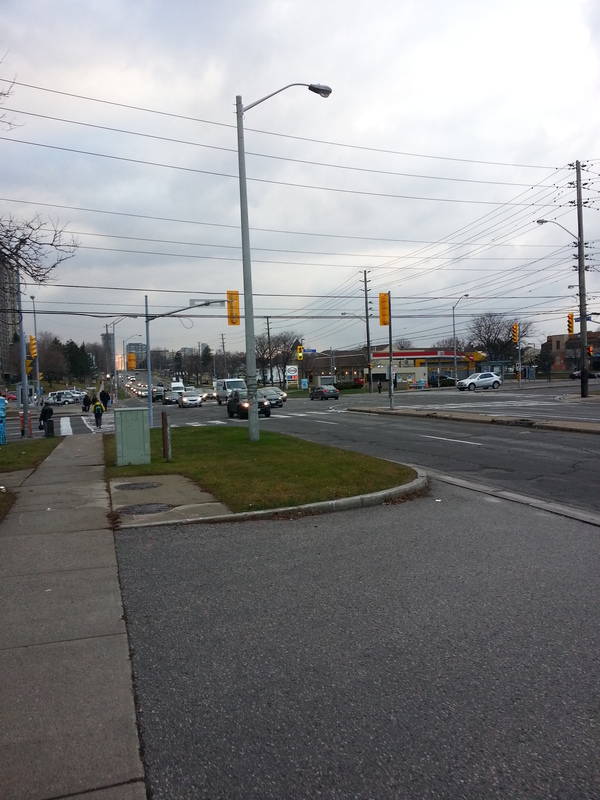 The intersection of Bay Mills and Sheppard is the start of the Sheppard Avenue East Avenue Study zone. On one side there’s another strip mall; on the other, a car dealership. They’ll surely be part of the plans. 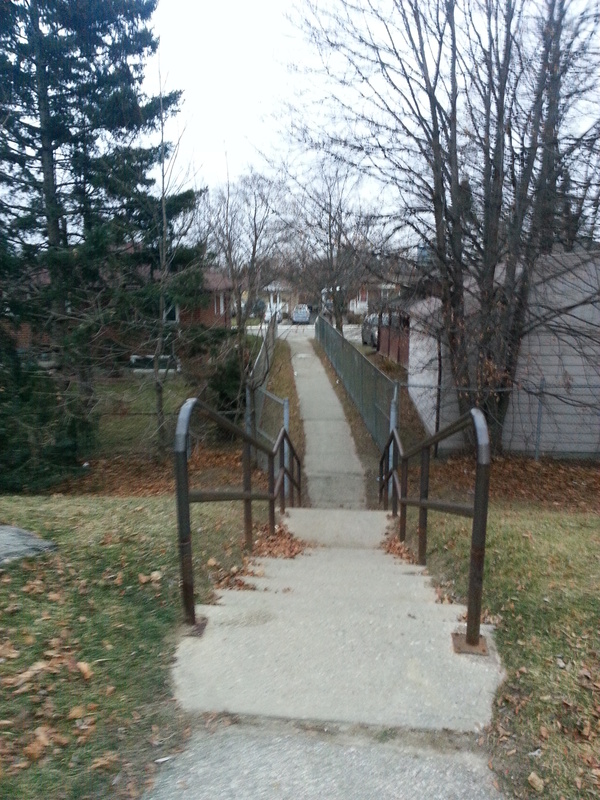 Warden Avenue is further down the way, but that adventure lies in the mentioned Wish Well exploration. For now, that’s a wrap on this one. 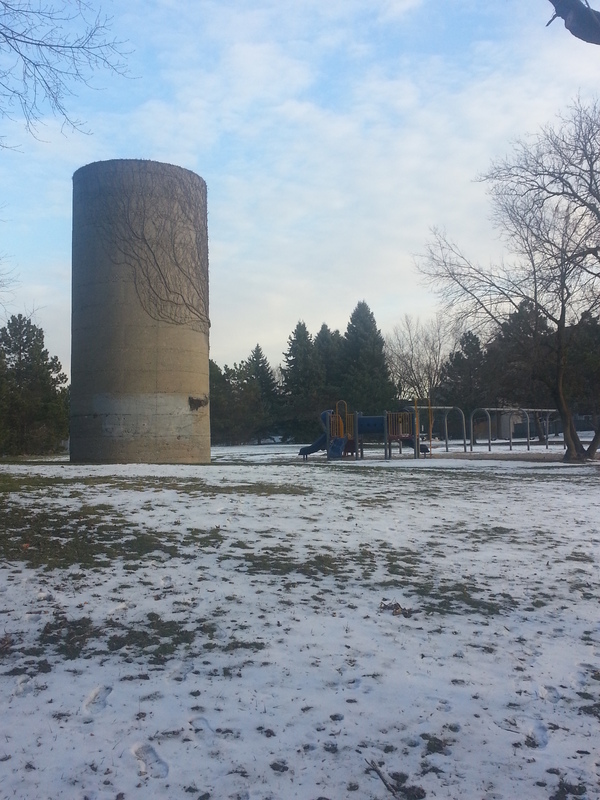 If you have memories of Agincourt Mall, Tam O’Shanter Country Club, Stephen Leacock School, or Tam-O’Shanter-Sullivan in general, I would like to hear about it. Leave a comment below or tweet me! 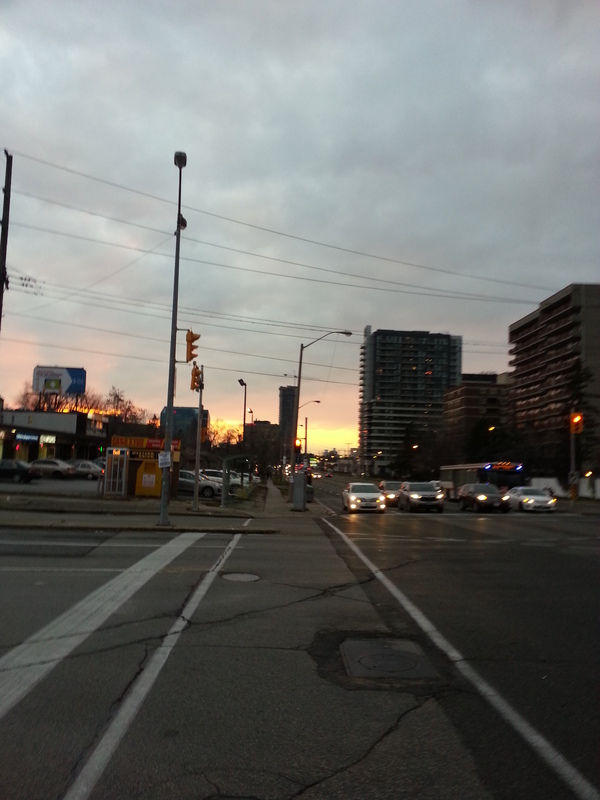 The area between Highway 401 and Sheppard Avenue East, Warden and Victoria Park Avenues has got a bit going on. A strip-mall and apartment lined main street, a winding neighbourhood of bungalows to its south — it’s unmistakably suburbia. The rise of its subdivisions following World War II, the effects on the natural and built environment, and its pending evolution make it an area of interest. First, from its beginnings as the narrow, dirt covered Concession Road III to its wide, strip mall-lined incarnation after WWII, Sheppard is about to get another layer. Sheppard East is an avenue, but it’s also an Avenue – at least, if you ask Toronto city planners. 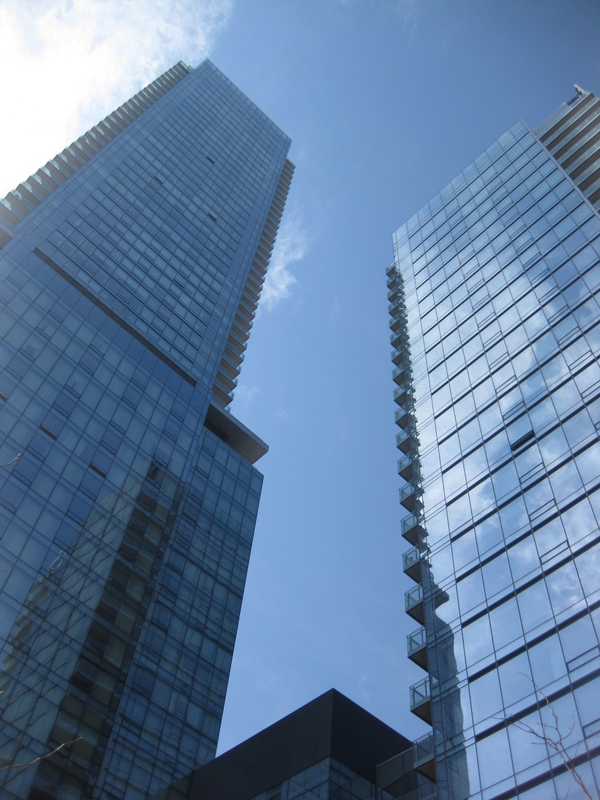 Avenues are corridors which have been identified to help accommodate Toronto’s growth. 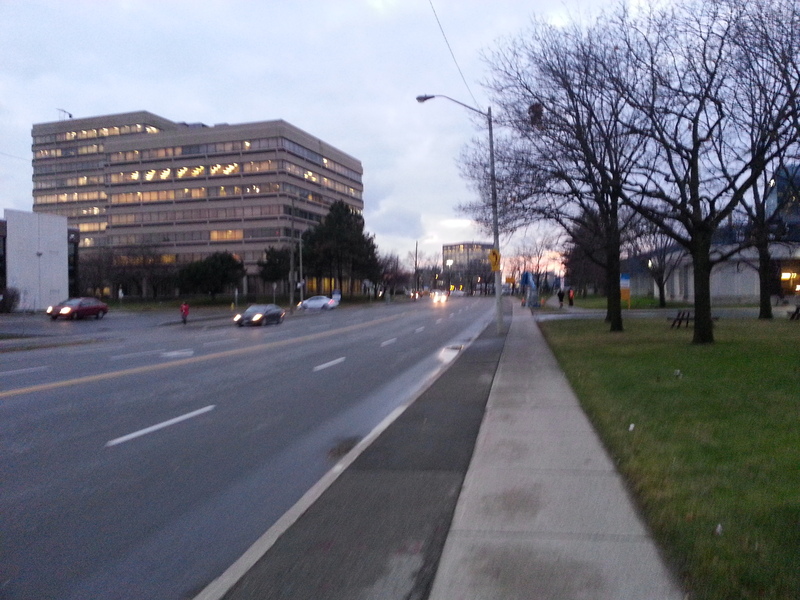 Avenues like Sheppard have to be rezoned to handle more density and this is done through midrise construction. The result are livable, walkable, transit accessible, mixed use communities outside the downtown core. 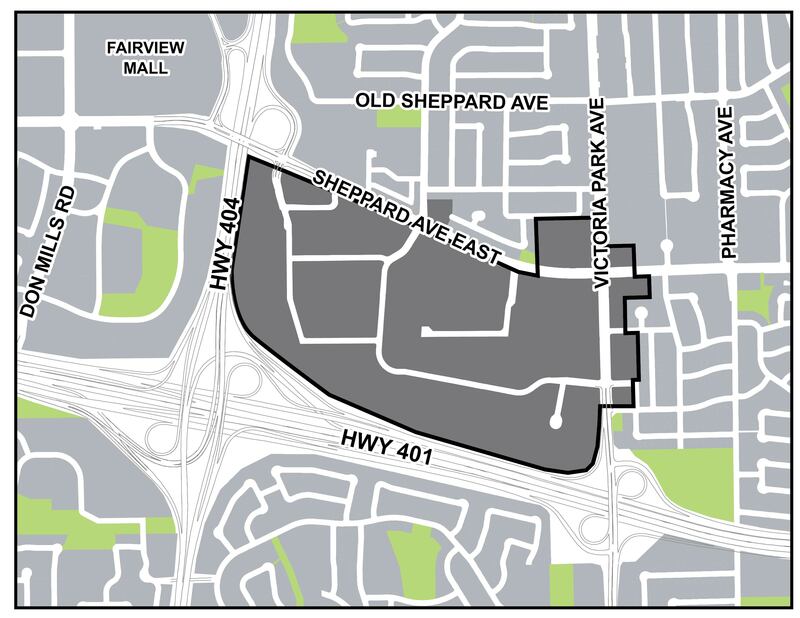 A Sheppard Avenue East Avenue Study sets out the upcoming changes. 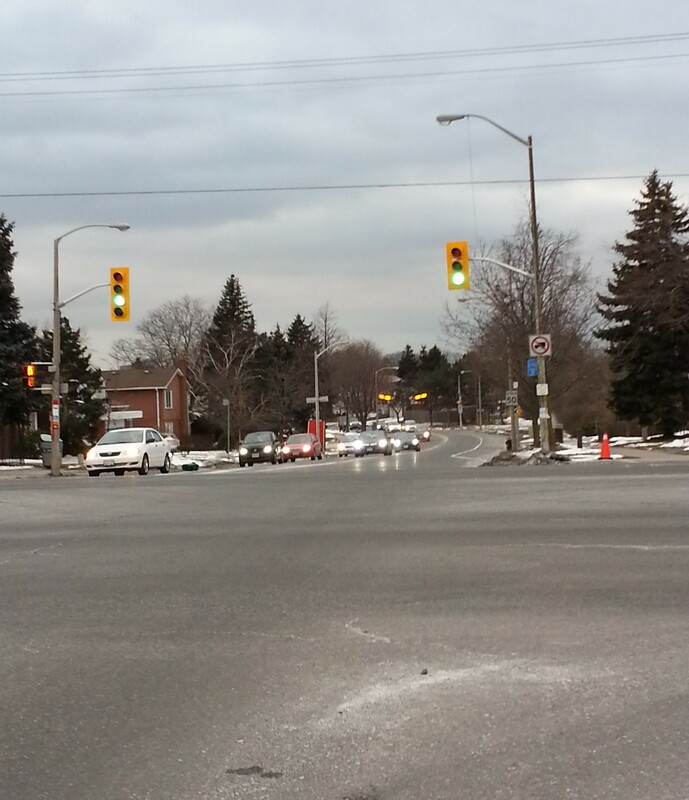 The centre of this transformation is the Sheppard and Warden intersection. 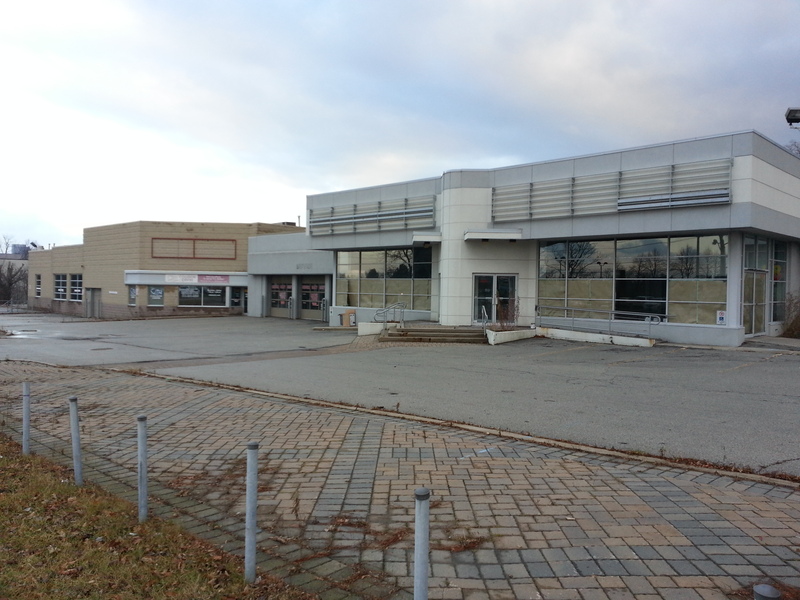 On one corner, a car dealership sits empty – and has for a while, as far as I can remember – and awaits development. 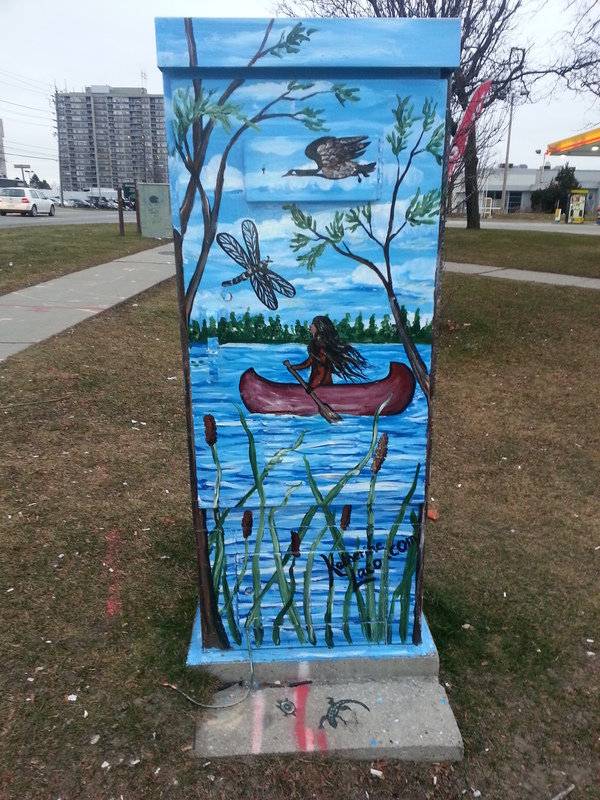 A muralled box by Katherine Laco colours the corner as well. On another corner, the aptly named Warden-Sheppard Plaza looks like it might be razed as well. I remember this mall for its longtime archor, the Galati Brothers supermarket, now Food Depot Supermarket. 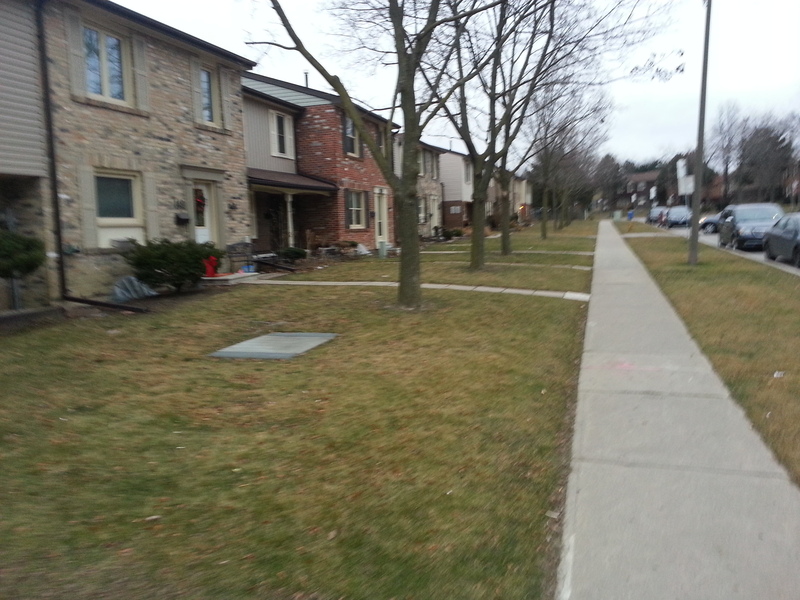 South of the Sheppard to the 401, the residential neighbourhood also sports some layers. It’s a bit of a name game to identify this neighbourhood. Tam O’Shanter-Sullivan (or simply Sullivan) marks the larger area in the Scarborough-Agincourt federal and provincial ridings. Just to narrow it down, though, I’ll elect to use the Wishing Well Acres moniker after one of the subdivisions. 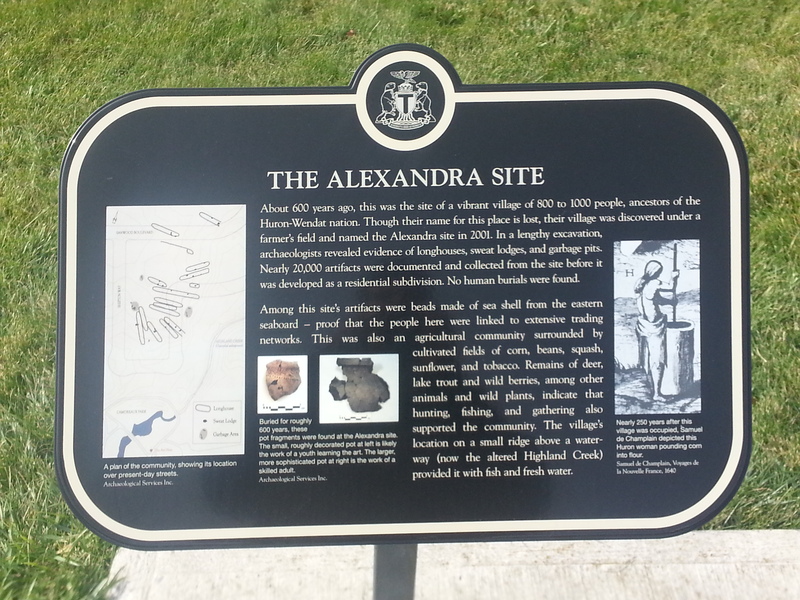 This area between Warden and Victoria Park Avenue historically consisted of three 19th century farms: one by Ichabod Vradenburgh at Concession II Lot 33, another by Christopher Thomson at Lot 34, and finally one by Thomas Mason at Lot 35. Source: 1878 Illustrated Historical Atlas of the County of York. Ichabod Vradenburgh was born in 1815, and emigrated from New York some time after. He married Jane Thompson, a Scarborough native, and had six children. The Vradenburgh name is pretty well represented in the new neighbourhood – sort of. Vradenburgh development, 1965. Source: City of Toronto Archives. The northern half of the plot, consisting of Palmdale Drive (above picture) and Warden-Sheppard Plaza, is constructed by 1975. 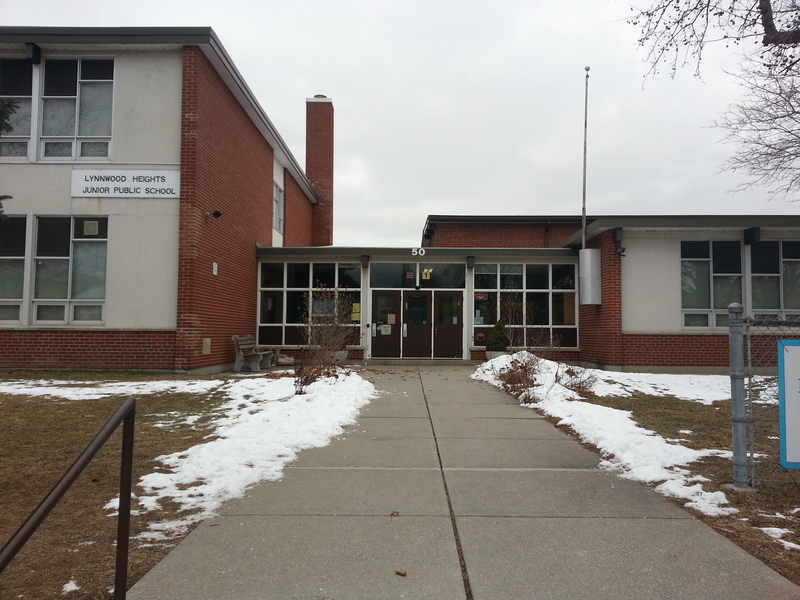 Vradenburg Junior Public School was built in 1957, which was approximately year the community starts to take shape. 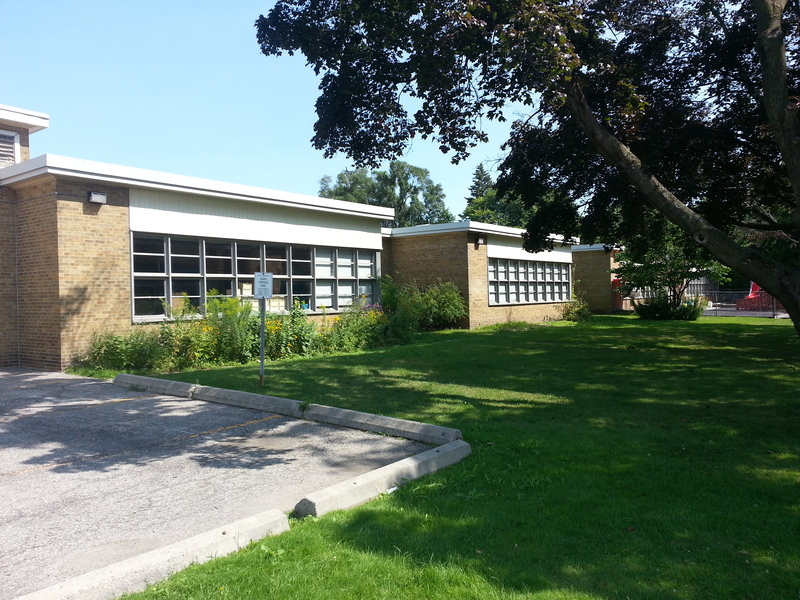 By the looks of its large windows, it follows the Modernist design of John B. Parkin’s 1942 Sunnylea Junior Public School. Vradenberg Drive and Park also bear the family name, although with an inexplicably vowel swap and consonant removal. Today’s Castleford Drive roughly marks the border between Vradenburgh’s property and Christopher Thomson’s Wishing Well Farm. Thomson was named after his Scottish father, who was one of the first settlers in Scarboro Township and who rose to a respected position locally. Christopher’s mother, Mary, was a native of York, Upper Canada. 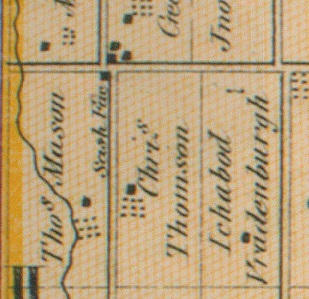 According to the Scarborough Historical Society, Thomson settled here in 1827 and the name of his farm derived from his hope to plant a well on his land. When he finally hit water, he called it Wishing Well Farm. Wishing Well Acres, 1956. Source: City of Toronto Archives. North of Sheppard is Harry C. Hatch’s indoor racetrack. 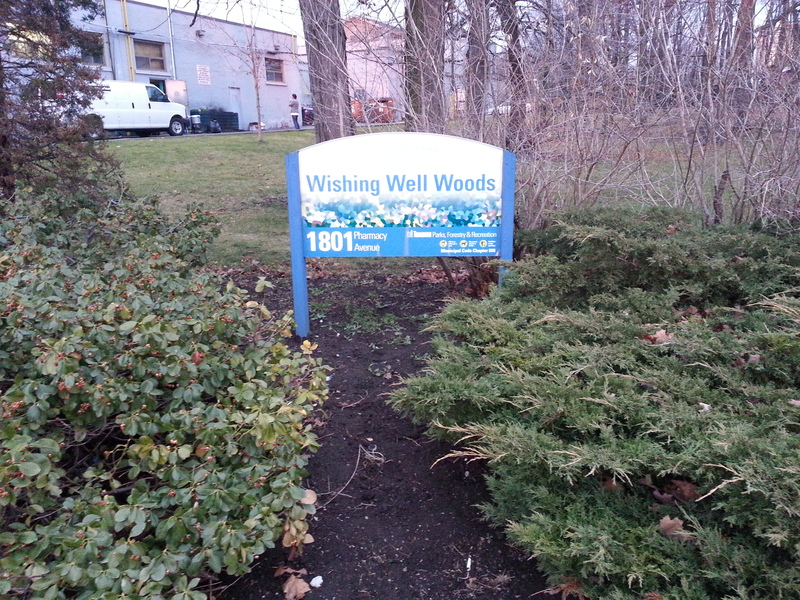 On the south side of Sheppard is Wishing Well Woods. I always feel like I’m taking a secret passageway anytime I encounter paths like this. 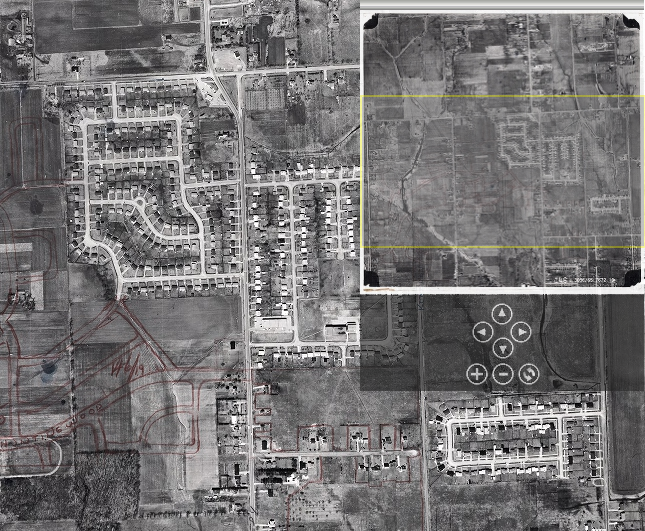 Wishing Well Acres, the subdivision that rose out of the farm in 1956, is notable for housing Canada’s Millionth Post-War House, a bungalow on Beacham Crescent also built in 1956, needless to say, marked a watershed moment in suburbia. 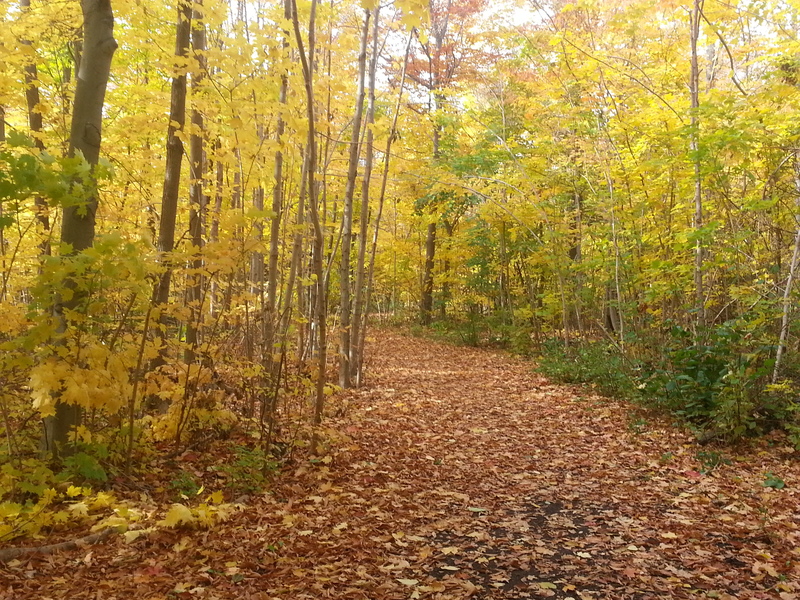 Hidden behind a strip mall at Pharmacy and Sheppard is Wishing Well Woods. Like Brimley Woods and Passmore Forest, this woodlot is what I like to call a colonial remnant or a rural leftover – a patch of 100 to 200 year old forest on a farming parcel which survived redevelopment after WWII. Of course, these remnants never seem to prevail fully in tact, especially in the case of Wishing Well Woods. 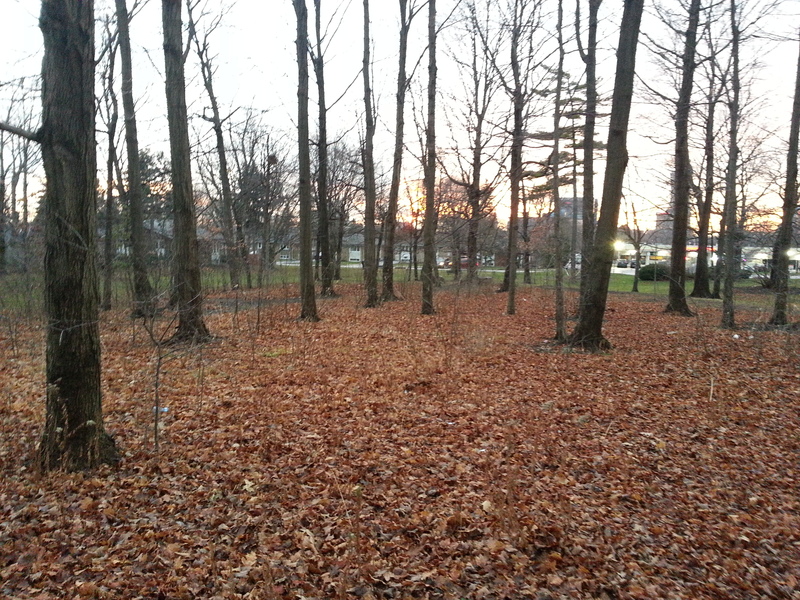 Compared to Brimley and Passmore Woods, though, this collection of trees isn’t much of a woodlot. That said, green space is green space and losing it would be a loss. 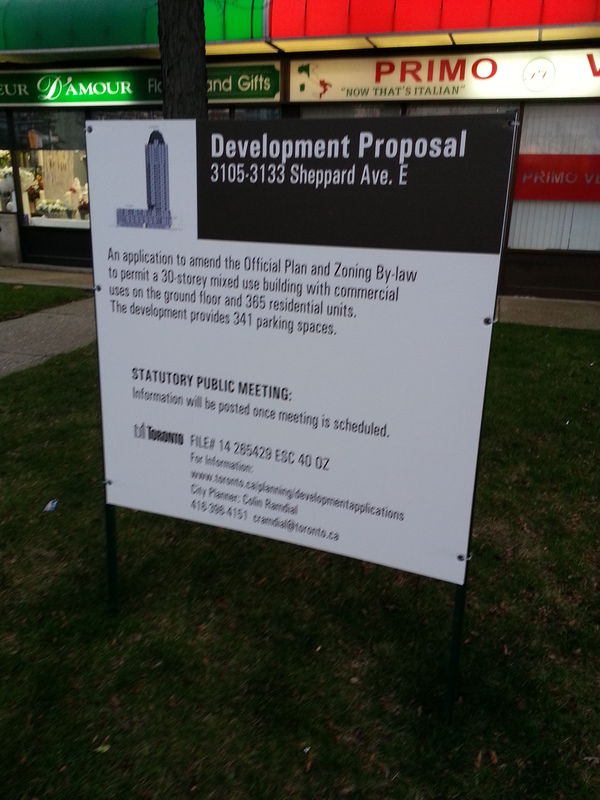 The mentioned strip mall at Pharmacy and Sheppard looks like it has development in its future. Hopefully that doesn’t affect Wishing Well Woods. 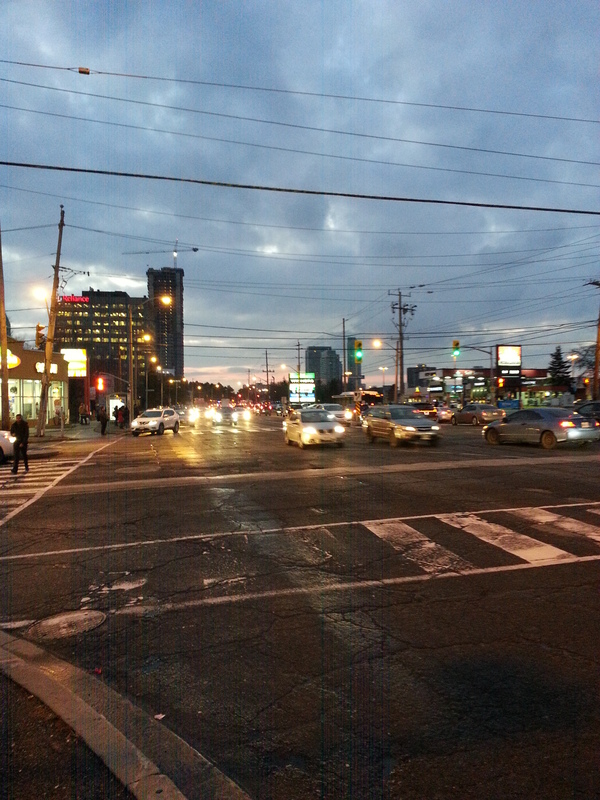 The Pharmacy and Sheppard intersection is no stranger to redevelopment. North of Sheppard is the Bridlewood neighbourhood, which gets its name from the indoor racetrack once located at the northeast corner. It was built for Harry H. Hatch, a distiller with a hand in the Gooderham & Worts empire and a championship horse breeder. The racetrack was torn down in 1958 and the Bridlewood development was subsequently constructed. 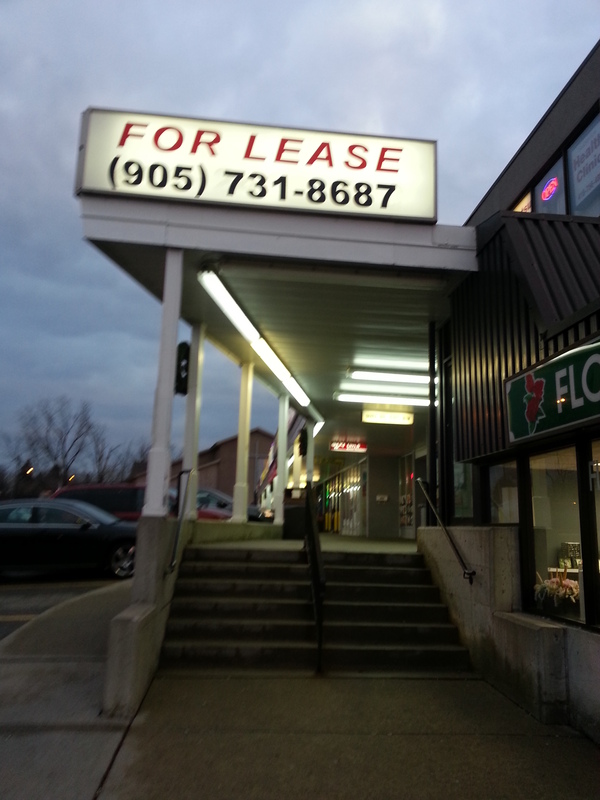 South of Sheppard, Pharmacy Avenue takes on a narrower, sparser form than north of it. 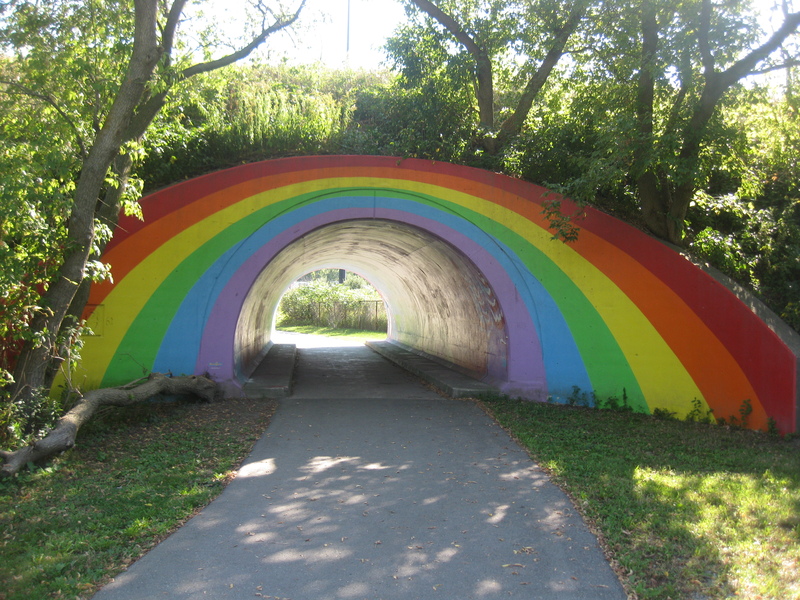 Historically, it ran through the area now occupied by Highway 401, but since the highway’s construction in the early t0 mid-1950s, it dead ends just north and south of the expressway. 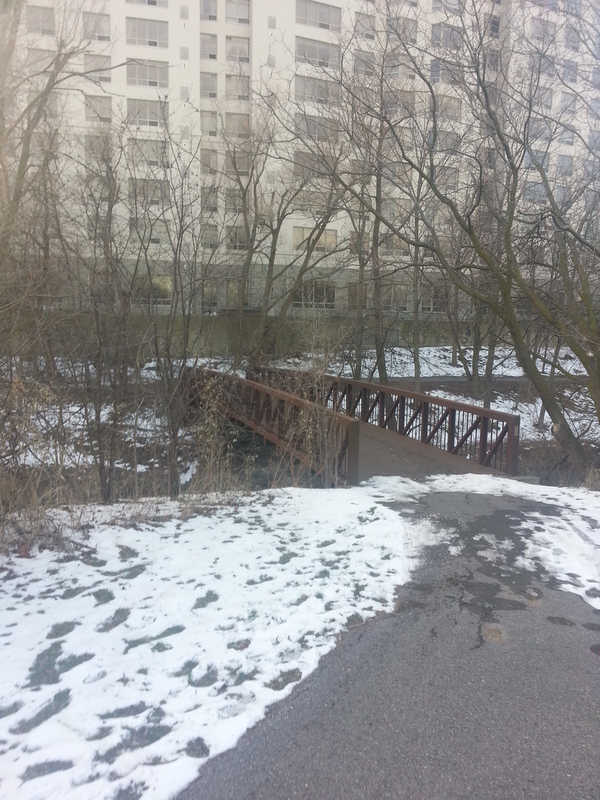 One supposes with its proximity to Victoria Park, a bridge at Pharmacy wasn’t needed. Wishing Well Park occupies the foot of Pharmacy. Anyone traveling westbound on the 401 near Victoria Park is at least familiar with Wishing Well and its baseball diamonds. But today’s baseball fields is yesterday’s farmfield, specifically Thomas Mason’s barns. The post-Mason farm development to the north, constructed around 1955, is named Town & Country. Information about Mason himself and the root of this naming is scarce, but if I had to guess, it might be because of the duality of (sub)urban and rural at the time. Further to the story, Wishing Well Park also once contained the headwaters to Taylor-Massey Creek, a slinking waterway that shows up in Warden Woods Park and the former Massey property in today’s Crescent Town. 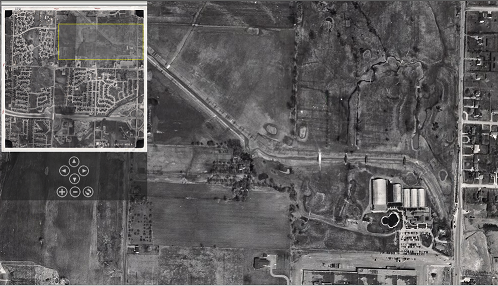 Today’s headwaters are located south of the highway after the original were buried and diverted to Highland Creek. Town and Country, 1956. Source: City of Toronto Archives. Taylor Massey Creek cuts diagonally through Wishing Well Park, then still a farm. As signs of its one time existence, one can pick out Taylor Massey Creek’s topographical imprint on the park. Moreover, streets like Meadowacres Drive pay tribute to it. Up on Victoria Park, Consumers Road and area is home to a large employment district in Toronto and a few company headquarters, including Universal Music and the street’s namesake company, Consumers Enbridge Gas. 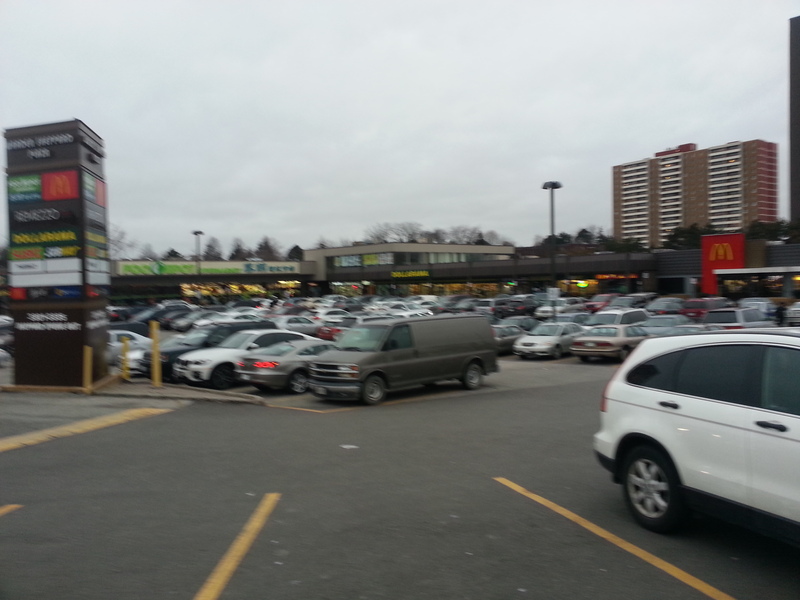 Like Sheppard East, the area is set for redevelopment with the ConsumersNext project. As a huge locale for jobs, Consumers Road Business Park is currently zoned as an employment area, but the environment isn’t very navigable sans an automobile. 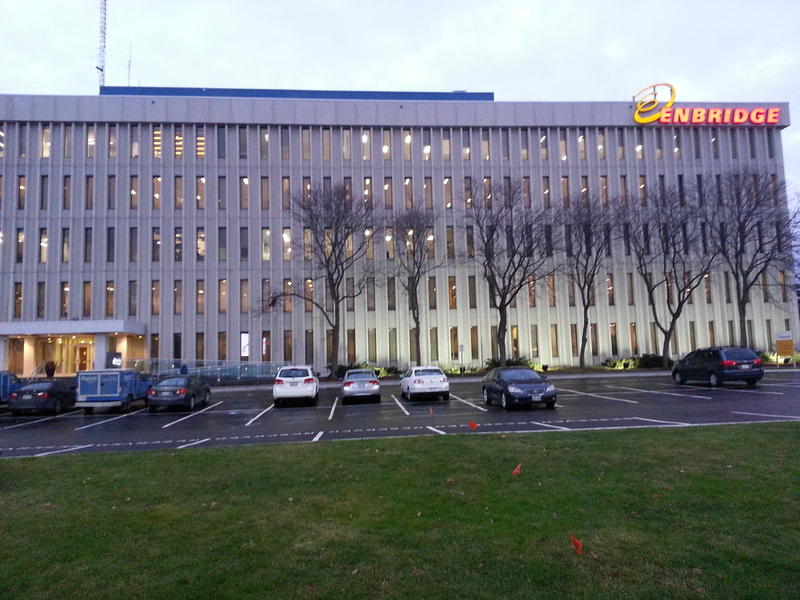 Among its goals, ConsumersNext will make the Business Park pedestrian- and transit-friendly. Consumers Next Map. Source: City of Toronto City Planning. Within the ConsumersNext lands is the recently named Ann O’Reilly Road. The new street contains an interesting bit of local, hidden history. O’Reilly was an innkeeper who, in 1860, along with husband, Patrick O’Sullivan, opened a hotel on the northwest corner of Victoria Park and Sheppard (now Victoria Park Square). The intersection and area became known as O’Sullivan’s Corners after Ann & Patrick’s son, Micheal O’Sullivan, opened a post office in the hotel in 1892. It’s a familiar origin story in Toronto: a post office (and/or hotel, in the case of O’Sullivan’s Corners) opens in an area and becomes a hub for the new community. The inn/post office was torn down around 1954, and without its existence, O’Sullivan’s Corners seems to have fallen out of use. 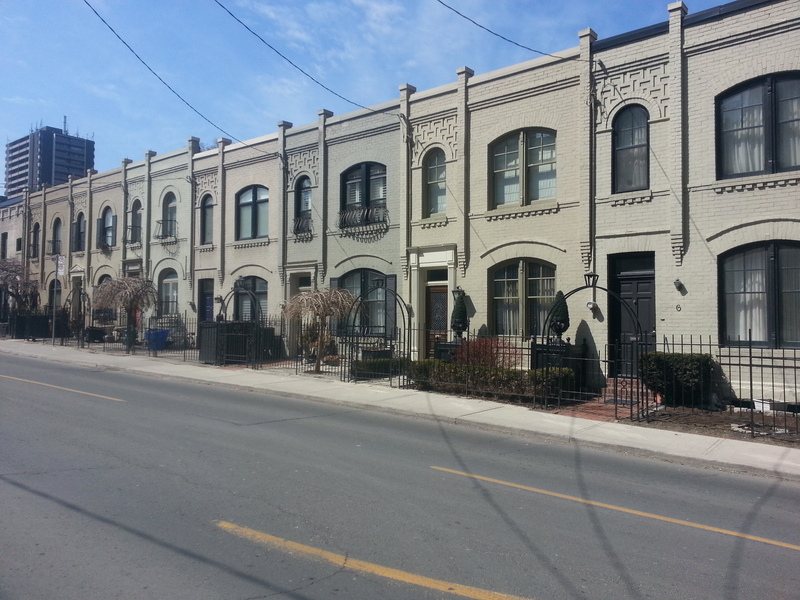 It’s a part of a long list of bygone neighbourhoods in Toronto. 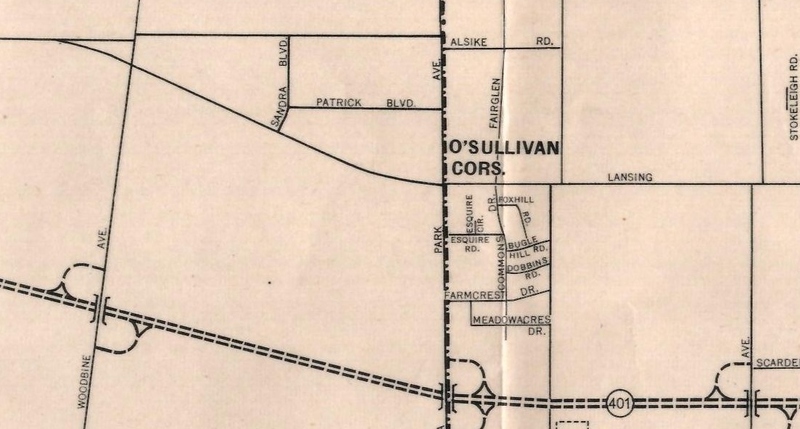 The grander community of Sullivan (sans the “O'”) seems to reference it, however. Metropolitan Map of Toronto, 1955. Source: University of Toronto Map and Data Library. 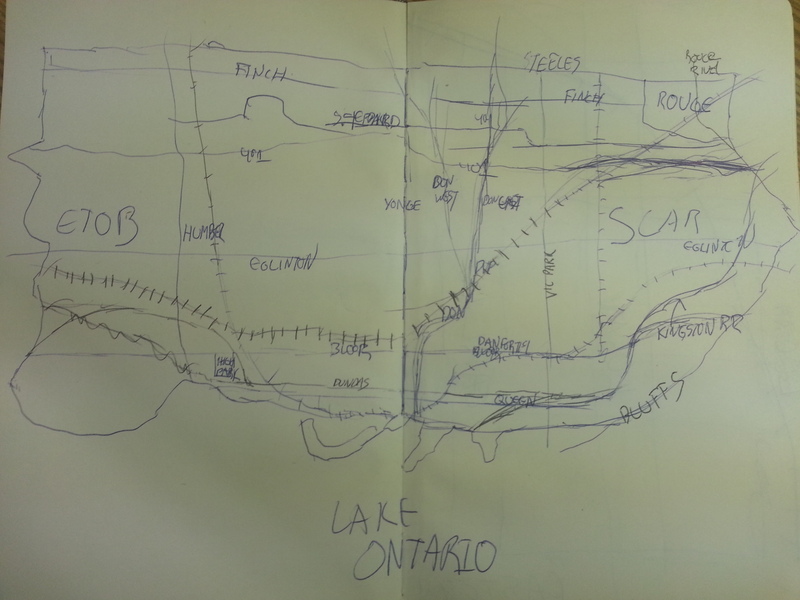 Note the routing of Sheppard Avenue at the top of the map. 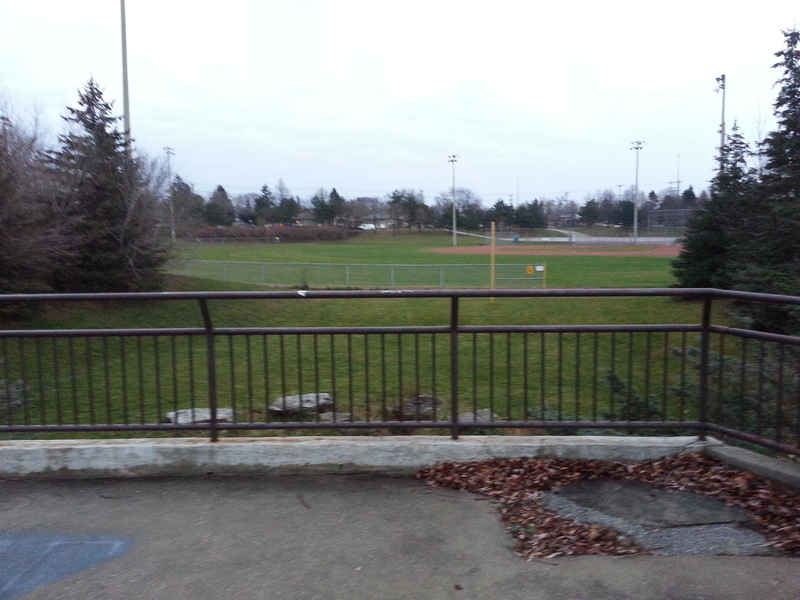 It once ended at Victoria Park Avenue. 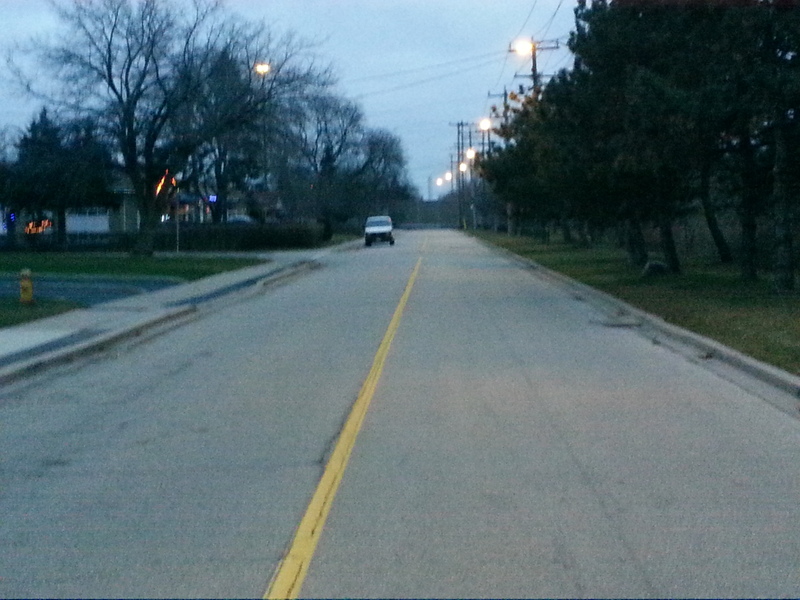 A separate street named Lansing Road curled down from Woodbine Avenue and straightened at Victoria Park before continuing into Scarborough. 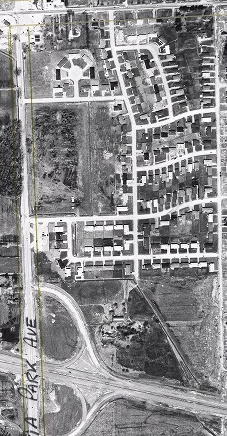 Around 1955, the two streets were merged to make the modern Sheppard Avenue. 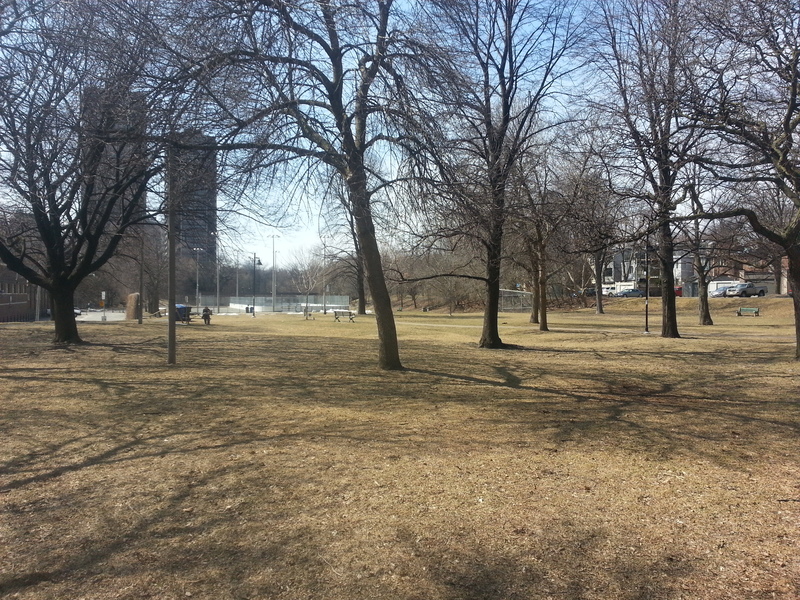 The ‘orphaned’ section between Woodbine (which became the 404 in 1977) and Victoria Park became Old Sheppard Avenue. 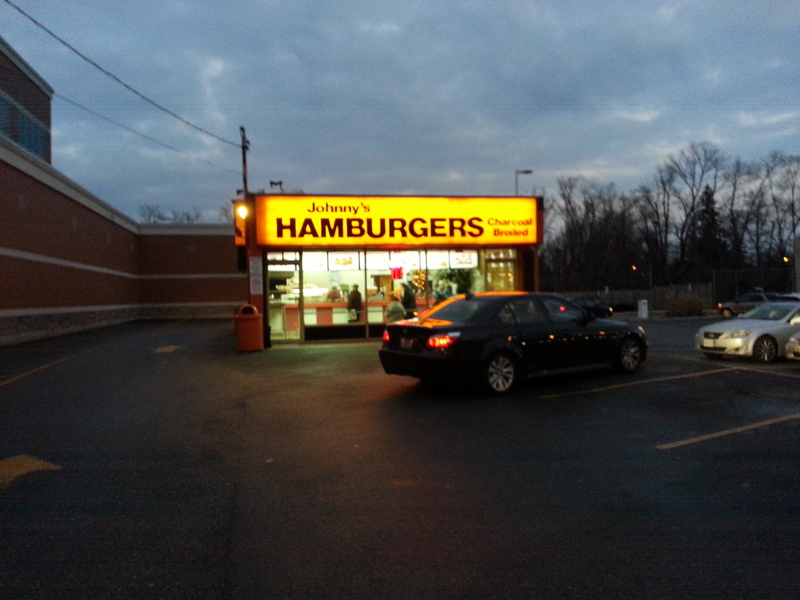 Today, though, there’s another landmark at the intersection: the famed Johnny’s Hamburgers, a fixture since 1967 which seems like it’ll endure whatever comes next for its surroundings.